Note: If you are feeding this to babies or young toddlers, make sure that the broccoli is cut into small, unchokable pieces and think about leaving out the corn. 2. Grease an 8-in square (about 2 quart) class baking dish. 3. 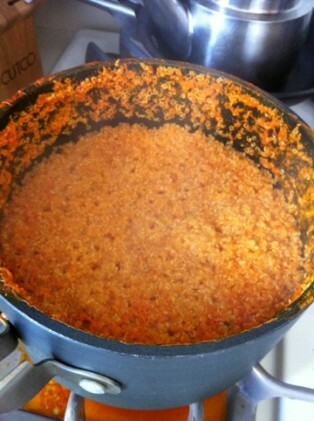 Stir quinoa into carrot juice and bring to a simmer. 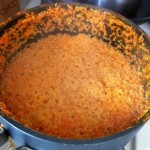 Cover and simmer gently until juice is absorbed (don’t be fooled by the foamy orange residue on the sides of the pot.) The quinoa should’ve broken open somewhat–you’ll see white thready-looking things. 4. While quinoa is cooking, heat oil in a large frying pan. Add the onion and saute until translucent and golden. 5. 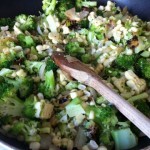 Add broccoli and saute for another 30 seconds, then add 1/4 cup water. Cover and steam for about 5 minutes, until broccoli is softened but still bright green. Turn off heat. 6. 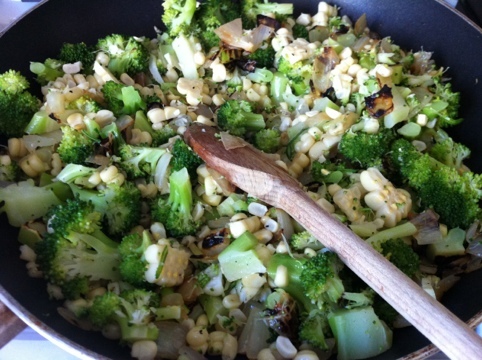 Either in a mixing bowl or in the frying pan, mix together quinoa, broccoli mixture, corn and 1 cup of the cheddar cheese. 7. 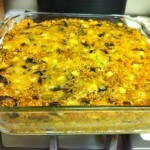 Spoon into prepared baking dish and sprinkle with the remaining 1/4 cup of cheese. 8. Bake for 25 minutes until the top is golden. 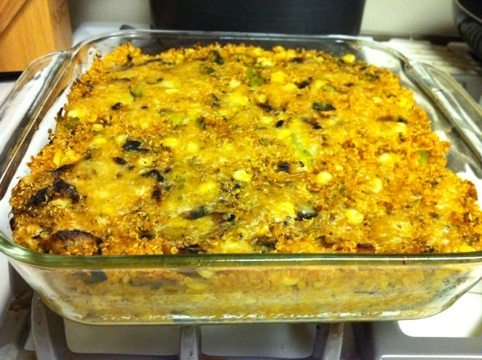 This entry was posted in Baby Food, Food and Drink, Food related, meatless monday and tagged #meatlessmonday, easy recipe, quinoa, vegetarian by jessica. Bookmark the permalink.